Gretta was born at Westfields, Market Bosworth on 28 February 1910, and was only four when her father died. Most of her childhood was spent with her six brothers and mother at Mill Lane, Shenton. She attended a small private school in a nearby village until she was old enough to sit for a scholarship that took her to Nuneaton High School, which she left when she was eighteen. A career in dairying was chosen as appropriate (see Mrs Heath’s (Mary Buckler’s) diary, page 101), starting in 1928 with a spell of practical work on a Cornish farm near St Ives and a County Council course in dairying, where she came top of her group. That was followed by a tough year in charge of a milk pasteurising unit near Matlock in Derbyshire, through one of the coldest winters for years, and two years running the private dairy of Lord Stair at Lochinch, near Stranraer in Scotland. Whilst there she was given a Leicestershire County Council bursary to take a two-year College Diploma in dairying at the Midland Agricultural College (MAC), Sutton Bonington in Leicestershire, where her brother Ted had studied and was now working in the Department of Agricultural Economics. College life, from 1931-3, seems to have suited Gretta, who made several life-long friends and gained the College Diploma in Dairying as well as the National Diploma (the only woman to get both in her year). With these qualifications Gretta obtained a post in the laboratory of United Dairy’s milk factory at Bason Bridge, near Highbridge in Somerset, where she worked from 1933 to 1936 as a dairy chemist. 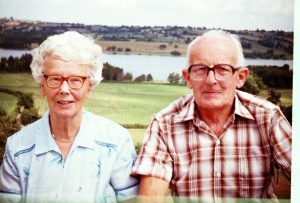 On 11 July 1936 Gretta married John Hudson, who had been a horticultural student at MAC from 1927-30 and good friends with Gretta’s brother Ted, through whom they met. From 1935 he had been Lecturer at Plumpton School of Agriculture, East Sussex, renting a 400-year-old cottage nearby where he and Gretta lived until 1939. Their first son, John Colin, was born on 18th January 1938, followed by Richard Anthony on 18th September 1939, by which time John had been called up to join his Territorial unit on the outbreak of war. Mrs Heath came to be with Gretta whilst her baby was born then took Gretta and her two boys to live with her in Yeovil. For the rest of the war Gretta and her boys were on the move, living for some months in Edinburgh, then in a rented house in Chapel-en-le-Frith, Derbyshire, where John’s people lived, and finally for two years in Burgess Hill, Sussex, to be near John’s job when he was working as scientific officer on bomb disposal in London. Mrs Heath shared Gretta’s homes, on and off, through the war but she died in April 1945 just as John was offered a post in the Department of Agriculture, Wellington. He was released from the army in May 1945 and took his family to New Zealand (where two of her brothers were living) in August. In August 1948 the family returned to the UK when John took up a lectureship at MAC, where Ted was now Head of the Department of Agricultural Economics in what had become the University of Nottingham School of Agriculture. They had a college house for a few years then built Northacre, West Leak, where they lived from 1956 to 1967. The boys went to Loughborough Grammar School from 1948 until they gained their respective scholarships to Corpus Christi College, Cambridge in 1957 and 1958. John was finally appointed Director of Long Ashton Research Station, University of Bristol from 1967 to 1975. For the first two years they lived in a house on the Station, then moved to The Spinney, Wrington, 10 miles from Bristol, where Gretta lived for the last twenty years of her life, seeing the garden that they had made and the trees they had planted grow to maturity. Gretta had her share of the Heath heart problems. She had three coronaries, in 1977, 1982 and 1985 respectively, and a massive stroke in December 1985, that left her partially paralysed and almost totally bereft of speech. Despite these handicaps she and John worked out an acceptable lifestyle based on his unfailing support and her courage, fortitude and philosophical attitude towards her problems. After 3½ tranquil years at home Gretta had another stroke and died a few weeks later (on 3rd June, 1989), peacefully, asleep in her own home. On 7th June, there was a private service for immediate family, as Gretta had wished, at Haycombe Crematorium near Bath.